This is updated release of my Windows 10 x64 PE Threshold 2 build 10586 Fall update version. As with the previous version this provides support for running 32bit programs (WoW64). The apps listed below are included in this build. Programs in Blue are new and programs in Green have been updated in this release. HWiNFO Hardware information and diagnostic tool Snipping Tool Screen capture application. Winmerge File comparison tool Opera Web Browser Fast, simple and safe way to get around on the web. AOMEI Partition Assistant Partitioning solution. Partition Wizard Alternate web browser. IrfanView Image Viewer FastStone Image Viewer User-friendly image browser, converter and editor. Mozilla FireFox Another great browser Easy BCD Boot management tool and bcd editor. Awesome job as usual, Gandalf. I love your releases, so thank you for your hard work! Is there a clean version of this without any bundled programs? hello gandalf !!! please upload rar file and rar several times so size become atmost 100mb.I cannot download bigger than that.please do this.it is a request by person needing it very severely. In the same download link I added a folder “Rared 100mb chunks” You can get the rar’s there. Run Gandalf’s_Win10PE_x64_TH2-05-13-2016.part01.exe to extract to the folder of your choice. you need all the pieces. please give rar file direct download link.I cannot find it.please send direct link so clicking it download will start immeditely. Thanks for the new version 5-3-2016. I appreciate the new features like mstsc and Iswitcher. Just one question: How can I change iswitcher to switch to German (00000407) keyboard layout, instead or along French (0000040c) layout? This looks great, thanks for providing it. Big fan of PE stuff, used to do it decade ago when Bart was doing it but this is fantastic now on Win10! Any way to include the VirtualBox drivers in order to test this within a Virtual Environment? Any FAQ on how to include other drivers or applications within this? Thanks for the update just curious if this release will recognize the new skylake chipset systems. I just booted up the 12-29-15 on a skylake system and have no network support going to download this one and try my luck. Can this be booted in UEFI Mode? i used Refus to make the ISO Bootable in only works in CSM Mode NOT UEFI mode. Try sticking with FAT32 formatting for your stick. I initially tried NTFS since I have a large USB stick that I wanted to also store a few large files on. I could only boot using legacy modes on a dozen or so machines I tried. Rerunning Rufus but selecting FAT32, I was able to boot via UEFI on each of these machines. Stick USB was FAT32 with rufus but no boot in UEFI mode. Wow, thanks for doing all the heavy lifting for us! This is more than great. Now I can happily abandon my own Win7 build with stale apps and poor driver support. The only thing I didn’t see was a good way to wipe a drive. My favorite for years was HDDscan but I can’t get it to run in Windows 10 and it seems abandoned now. However, HDDguru’s low level format tool works well (unlicensed mode is limited to 50MB/s)… http://hddguru.com/software/HDD-LLF-Low-Level-Format-Tool/ The second download link (“Windows Executable”) is a portable app. It’s no problem to run from a separate folder but maybe you could add it to your built-in apps at some point? Acronis 2016 in the tools sections has an app called acronis drive cleanser. I think it will do the trick. Yes, you’re right about Acronis tools, I didn’t realize that was in there. No need for you to add another redundant app. Still, I prefer HDDguru’s app (partly because I have a license, lol). Am happy that it (and many other portable apps) work very well in this environment. You would want to use the clean all command. I’m currently downloading this to try but, judging from your current and past comments, it looks like you’ve done a great job. Thanks. I found your page while looking for tutorials on how to get started making my own images. Do you have any such tutorials or point me in the right direction to start learning to do this for myself? Please and thank you. Gandolf thanks again for an awesome PE build. Is there any way to not load the floating clock by default by modifying the boot.wim? Thanks for the quick response. This is exactly what I wanted to know. Any recommendations for an application to recover lost wifi passwords from non bootable windows installs? using double driver to scan the local machine for the video driver. How do you load it in your session for better resolution? No MEGA não encontrei a pasta: “Rared 100mb chunks” que disse a outro usuário que está com o download particionado. Por favor, coloque os links aqui, pois o MEGA está limitando a banda de downloads e não estou conseguindo fazer o download de uma só vez. Já no OneDrive avisa que o limite de compartilhamento foi ultrapassado. In MEGA I not find the folder: “rared 100mb chunks” that said to another user who is partitioned with the download. Please put the links here because the MEGA is limiting the band downloads and am unable to download once. You onedrive warns that sharing was exceeded. The rarred folders are not in the mega link. Try the onedrive link it is working now. Thanks for all your hard work one question though. How do I burn this to a usb using linux tried dd, suse studio imagewriter, and etcher, all failed. Need this to update firmware on a samsung ssd but if I need windows to burn it, it kind of defeats the purpose. Thanks again. Hello Gandalf,fan of your work..i have one question,everytime i boot up the usb drive is taking like 20 minutes of “Windows Loading files” , is there any way to speed up this? https://www.plop.at/en/bootmanager/screenshots.html then before you press enter swap it with the gansalfs usb. it should boot up at the fast speed. Is there any way to add dot net framework to this? Doesn’t seem to work. I tried different versions of Paintdotnet and none of them worked, all complaining that dotnet framework was not installed. Never mind I worked it out. The dotnet framework is in the “programs” folder for some reason instead of incorporated into the wim, so when I deleted the programs folder to get rid of all the bloatware the dotnet framework stopped working. I Really appreciate it that I got a chance to use this Fantastic PE. Is it possible to add tor browser? No. many apps will not work running from dvd disc. Thanks! It´s a great tool!! There is a app to restore files from shadow copy (VSS) in this compilation? I need recovery files from win7 system crash… (using previous versions). On investigation – the USB stick doesn’t show in disk management. So whilst in Windows PE, I have to unplug and replug the USB key, then right click a program and see what drive letter it should see, and change the drive letter manually to get things to work. Any ideas on that one? In this version, have framework 2 and 3.5 installed? Hi, is there a way to put the software in the boot.wim ? I want to put the wim file on a pxe server so I can boot it over network. Thank you and great work ! On my earlier builds I was doing this, but it made updating the apps difficult. Thanks for this great work. I have some problems with booting USB stick. I had used rmpprepusb tool for creating bootable usb stick. I put the this 4gB W10x64 iso file to the root of usb and also copied the Cdusb.Y for the safest sake to the root of usb stick. Win10PE normally boots/loads and seems to run normally but in essence non of the application programs does not work because of the program files folder under the Y disk is not seen on file explorer. What should I do? Should I format the usb stick with Rufus and make it bootable only and do not copy any system or grub4 dos file to it? The reason of I use rmapprepusb is that I make a multiboot usb stick and and arrange the appearance of boot system with a menu.lst file. Pls kindly comment. Hi,i have problem booting from DVD this (Windows 10 x64 PE Threshold 2 build 10586) burnt in RW DVD & Try 2-different Dell PC’s, both are the same result BSOD. kindly help me. try from a usb stick. really not intended to boot from dvd. Thank you a lot for this. Never had seen a so much pretty WinPE bevor. Driver support is amazing. 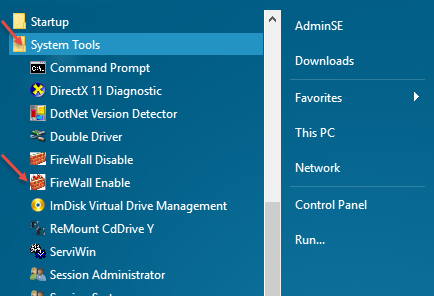 Win10PE Tools are very useful. Diskpart does NOT securely wipe a drive. You are severely misinformed. A full wipe requires that all data be overwritten, a process that can take hours depending on drive size and write speed. The acronis tool does this job and even has a utility to browse the raw contents to manually/visually verify too. I just happen to prefer a different app. I am severely misinformed, lol. “Clean all” does the job. Wow… speedy reply – thank you gandalf! Y:/Start.exe is a 16-bit applications. You do not have permissions to execute 16-bit applications. Check your permissions with you system administrator. what you burned it to. System your booting into. which build are you using. 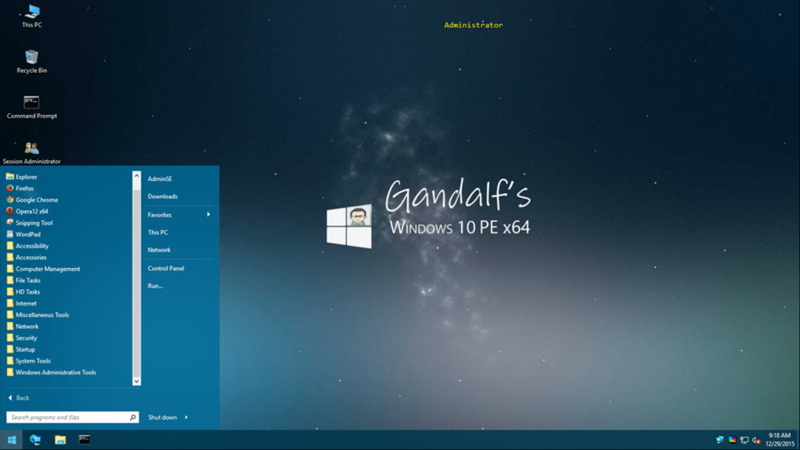 ok… I burned Gandalf’s Wind8.1x86U1PE (Windows 8.1 Pro) to a 4gb HC(4)SD card. System type: 32-bit OS, x64-based processor, CPU: i3-4010 @ 1.70ghz. RAM: 4.00gb (2.43gb usable). does that help? First try another build and see what results you get. Hi Gandalf, I already tried your 8.1 PE and it is awesome. right now I’m trying this one. I’m wondering why on this version the task manager looks like the one from Windows 7 not the one from windows 8 and newer? I forgot to set it to the new look. Will correct on next build which will be the Anniversary update. Any way to setup a VPN connection in this version? Copied the UO-extension folder “cjpalhdlnbpafiamejdnhcphjbkeiagm” into the Default User’s profile, but that didn’t work. MyLan Viewer not working. Nag screen says trial expired just FYI. Also Just wanted to say thanks again on an awesome PE build. Keep up the great work. I would love to make my own Windows PE environment :) Know any good tutorials that helped you out? Hey, very very good work. Thank you for that. I have four little comments/wishes. 1. Updateability and extensibility like in the Win8 version. Write changes back to usb stick. 2. Why not AOMEI Backupper? Seems to me it does have less restrictions in the free version compared to Macrium Reflect. 3. Bootspeed seems very slow. 2 Minutes from a fast USB stick. How can I improve that? I have tested MediCat which needs only 1 Minute for its MiniWin10. 4. A Filesync tool like FreeFileSync would be great and TeraCopy for big copy jobs. Can I use this Windows 10PE x64 Threshold 05-13-2016 on my 64 bit Windows 7 Ultimate UEFI computer? Great work! I Love it. There are a few apps that I use that aren’t included. I can add them no problem but have had absolutely no success figuring out how to edit the menu to insert them. Can you point me in the right direction? Once again Thanks Great Work. You could open the extracted boot.wim in the sources folder with latest version of 7zip (which allows opening and saving changes to wim file) the drop your shortcuts that youve created into the Users\Default\Desktop\ folder. Or you could go to the windows\system32 folder and open the win10pe.cfg file in notepad and edit the shortcut section to point to your new apps. I can actually install some programs manually like R-TT drive image and others but they are gone when I reboot into PE (as expected). Is there a forum for support? i just downloaded and used your “Windows 10 x64 PE Threshold 2 build 10586” for the first time in my life since last week. It is awesome and thank you so much for your hard work. i must have missed a lot of actions before this. i used it to check my computer hardware. i only know how to use seagate seatools to check hard drive but this tool is not in your build. may i ask, how to add seatools into your build? if the above request is impossible, then may i ask which tool in your build does same function, ie can do a DST (drive Short Test) for all brands and types of Hard Drive? Thanks for the great job on the disc. I tried to run Macrium Reflect 6.1 and it is asking for a license key (seems to be the home edition instead of the free edition). excellent antivirus (uses Bitdefender scan engine), portable, freeware. is the improved successor of encryption tool TrueCrypt, freeware. Would love to see Seagate Tools, Western Digital Data Lifeguard, WinDTF Hard drive testing tools added to your list. For some reason, i can’t edit anything inside the “.iso” file, especially “boot.wim” by using the latest 7-zip. That should work. It could be opened somewhere else. Try the ‘ol reboot and retry. Did that, i even tried it on 2 different machines, same thing. Can you please tell me what’s your current version of 7-zip? Can you fix this or put it on torrent too? the download links sometimes work and sometimes did not work ! it is strange thing ! Thx for that amazing WinPe. “Active Undelete Data recovery software that allows you to recover lost, deleted, and formatted data” isn´t part of that WinPe. Is it possible to get it back in the next Version? Hi, This software is great. I use active boot and this bypasses permissions but in this instance I need to use previous versions.. Is there a way to get this enviroment to bypass permissions? did you try logging in with the system account. Shortcut to switch from admin to system should be on the desktop. is there a way to comment out lines in the win10pe.cfg file? I would like to remove a few shortcuts from the desktop however I do not want to just delete the lines if possible. would be nice if you would add/integrate DART 10 tools perhaps in dual boot? I tried to boot this image with Windows Deployment Services (WDS). It worked fine. But the Program Folder didn t load. Do you have a share on your network using the Y: drive? I have setup a drive with dual partitions. One partition is win 10 (win to go) and the other partition is Gandolf. Any chance you might a suggestion for getting the dual boot to work? I have extracted the ISO to the second partition and tried to use EasyBCD however its pointed directly to the boot.wim and does not load the Y drive. I have this wierd problem with the winpe network. I can see the adapter in the Network Connections window, but the interface won’t show anywhere else (ipconfig, netsh wlan) including PENetwork. I tried to refresh the list and force it to look for but it still won’t show up. I would like to request that you add TechPowerUp’s GPU-Z to your list of Programs. Currently, when trying to run GPU-Z.1.10.0.exe generates a System Error: “The program can’t start because dbgcore.DLL is missing from your computer. Try reinstalling the program to fix this problem”. hi~ can you please shared the one drive link to my email? because my download speed is too slow for google drive, haven’t finish download yet they already kick me out. Is there anyway to modify the image so that I can make it connect to a network share at boot and use it to hold all the software instead of the USB drive? I want to be able to PXE boot the iso on multiple clients and have only one copy of the software that needs to be updated. And if not is there a way to make PXE work at all with your PE images? I have tried for several days to get onedrive to find your Windows PE boot. Each time I get an error that is has been moved or is no longer available. Would you be so kind as to send a share link to the file location so I can attempt to download the file? I understand it is rather large and may take a long time to download, but I can be patient. Thank you for all your great work! Amazing work, Thanks a lot but I am unable to download I thought the problem was with me but as in mentioned above this is something common. Please Help I cannot download from Mega drive, one drive and also Google drive stop working after some time. waiting for your earlier response. I added your email, the the onedrive share. It should work now. Wonderful! Thank You very much for so quick rely! Wonderful! Thank You very much for so quick reply! Did you intend to carry out an update with the built 1607 ? Thanks for all your Great Work! The instructions to add additional drivers is Especially useful to me. I’m looking forward to the 1607 update, do you have a timeline yet (not rushing, just asking). I’m having trouble downloading, please add me to the Onedrive share. Kudos to you for creating a really useful Windows PE. 13/05/2016 version. My problem with it is when ever I try to re-create the boot.wim file using gimagex I get a file not found error when using the capture mode. The file is bootmgr.efi which exists but gimagex can’t find it, there does seem to be some spurious data added to the filename which must be a fault with gimagex because it does not exist on the filename. This error occurs even if I make no changes at all and just try re-create the boot.wim file. Thanks Gandalf, I will give Dism Gui a try, I am aware that I can use 7ZipPortable v16.02 to edit the WIM file but I was surprised that gimagex had problems with it. Yes 7zip does allow you to add or remove files now. Dism Gui lets you add or remove drivers, packages and features. I just tried Dism Gui but it has no capture feature, the Gui has the control tabs for capture and append, but when I try to capture an image I get an error message stating that Dism cannot process unknown command ‘capture’. So it’s not possible to use Dism Gui to create a WIM file, but I can use it to edit packages, features and add drivers, so maybe it’s moot that it cannot create a WIM file from scratch. I just discovered that I had extracted the boot.wim file using an older version of 7Zip, version 9.20, if I use 7Zip Portable v16 or gimagex to extract the boot.wim file, then gimagex will capture it properly, however it will not boot in the ISO, I get a winload.exe error this time instead. This error still occurs if I extract the boot.wim file to a folder and then just re-compile it again without making any changes to it using gimagex, I get the winload.exe error when trying to boot the ISO. ??? What are you trying to do? There may be a simpler way depending on what you are trying to achieve. For all those having a different keyboard layout than USA or FR just start the Macrium Reflect and select your keyboard then just close it (it will stay until you close the WinPE session). Aaaaanyway, is it difficult (or even possible) to have Gandalf’s Win10PE on a hard drive partition as a dual boot option? …or do the methods in your video on dual booting Win8.1 also work with Win10PE? Again, I apologize if I am missing this somewhere. AND THANK YOU SO MUCH for all your work! PS: I may have accidentally sent you a Google Hangouts Invite… oops! & sorry! Really cool WINPE! I read in the comments that earlier versions were capable of running from PXE, which versions were those? I looked at the oven to see how to do this but the info on how to add programs to your DVD seems a bit complicated and fragmented. I’ll keep at it but it you are so inclined it would be nice to have Veracrypt part of your packages in the DVD. Thanks. This whindows 10 is a livecd ? I’m booting this version with Easy2Boot and it comes up with Windows 10 fine, however, when I try running any of the programs in the start menu they don’t launch. I see that they are pointing to Y:\Programs, however, when I view the drives the Y: drive doesn’t show up. I’ve checked the MD5SUM of the .iso and that’s good so it’s not corrupted. Can you think of why this Y: drive isn’t appearing to Windows? Thanks. Thanks but that didn’t help. When I did that then the Easy2Boot USB stick showed up under Gandolf as the Y: drive (whereas it was the D: drive before), but that’s not what needs to be done. The problem is that in Gandolf Windows 10, it is missing the drive that contains all the programs (things like CrystalCPUID, in the start menu it says it is in Y:\Programs but that drive is nowhere to be found). If you click on this link and look for Gandolfs (skip to item 225) there is a link that explains how to get this working. In short there needs to be an additional ini file created and placed in the root directory of the easy2boot drive. That was the solution, thank you. Great job! I have used your PE on several systems for the past weeks and have no issues with UEFI but can not boot with BIOS. I get ?X?MSDOS5.0 on the screen and locks up. Thank you for any help. Muchas gracias por tu trabajo. Me ha sido de muchísima utilidad. I am trying to run your WIN10PE from a hard drive but have issues. If I make a MBR (Fat32) partition on the hard drive and copy WIN10PE to it I can boot a UEFI computer but not BIOS (error in my last post above). If I use a partition program like Active to copy the partition from the USB memory stick to the hard drive (NTFS) I can boot BIOS but not UEFI computers. The USB memory stick (NTFS) works great with both BIOS and UEFI computers. Any help would be great. Hi gandalf50, I sent you an e-mail about 2 weeks ago. Would you be interested in provide me a consulting service ? It’s about Winpe, if yes please answer my comment or send me a e-mail message. No I didn’t die. But sadly my wife did after a year long battle with cancer so I have been a little preoccupied. I will try and get one out this month. Please accept my condolences for the loss of your wife. Good Lord!! I freaking HATE that awful disease!! We’ve lost so many great people before their time. You have my sincerest condolences, Gandalf. Just wanted to say thank you for all the work you have done, it’s munch appreciated. When you restart the system everything installed (dll, ocx, etc) it is eliminated. How can I do? This is by design. You can install portable apps to the usb location. Is there a way to install your WIN10PE on a hard drive so it can boot both BIOS and UEFI? I have got it to work with BIOS OR UEFI but not both. The hard drive is Ext. with a USB adapter. Thanks for your help. I have downloaded the 8.1 x64 version,(thanks Gandalf, great work) but have noticed that there are more apps, and updates, on the win 10 version. I was particularly interested in the Acronis True Image app. Is it possible to get this and the other apps without downloading version 10? If you set Rufus to GPT for UEFI, which .efi file should I point the bios/boot manager too? Newest Redstone version will boot – but I get blank screen. starting explorer.exe brings up the GUI, but get multiple error messages and nothing will work. Just a couple of quick questions… I hear that many interface hacks and unsigned driver kludges (currently working in Windows 10), stop working under Anniversary Edition… I assume it is increased security settings. Can you see this having an effect on included software on your AnniversaryPE ?? I just recently stumbled across your Windows PE projects, looks nice. I had a couple requests – hopefully it’s something you might consider. 1.) Could you add Veracrypt into the build? 2.) Would you consider creating a “hardened” version of the build following the benchmark guidelines at CISecurity.org? These would primarily be local group policy settings to increase security/privacy settings in Windows. Or perhaps there could be a way to create an automated script to import these? Will This Work On A Mac? No it wont be able to boot. any chance you could add driveimage-xml ? HI Gandalf, IS it possible to add Checkpoint Dynamic mount Utility to recover data from Encrypted HDD? It has to be added to the dism image as it contains a driver. I can provide you the utility if you need it. I don’t know if I am missing something or not. Is there a way to discover my local network? I would dearly like to access my local file server. Hi, and THANK YOU for this GREAT PE you put together. Helps me out a lot. My question is about logon/startup scripts. Is there any way to automatically run a script every time it starts up? Just some standard cmd commands. Maybe a location to place a batch file that will execute upon logon? I understand that the PE already has a startup configuration script. Can I add my commands to that file? (and if so, where is it located?). I see that the 64bit version has a TheOven_Startup_CD.cmd file. I thought I’d try that. I added my commands to that file and rebooted. But they did not run. I currently manually invoke my batch file, but am interested if this can be automated. Yes you can do it. Extract the boot.wim from the iso and open it with 7zip. Navigate to \users\default\AppData\Roaming\Microsoft\Windows\Start Menu\Programs\Startup\ and drop the script in there. Save the boot.wim and put it back into the iso. I already had the PE written to a thumb drive. So I extracted \sources\boot.wim > added my batch file > recreated boot.wim, but it wouldn’t boot. I returned the original boot.wim, and it boots. I did’t think this would make a difference, but might as well try. I then removed the PE from the thumb drive, and did as you said. Extracted the iso > extracted the boot.wim > added my file and recreated boot.wim > rebuilt iso file and wrote to drive. It doesn’t boot. I then replaced boot.wim with the original file, and it boots. So with both methods, the original boot.wim file boots, and my recreated on doesn’t. Sidenote: for some reason I couldn’t understand, my recreated boot.wim files were much larger than the originals. In the 32bit, the original is 499MB, and my file was 1.24GB. In the 64bit, the original is 820MB, and my file was 2.11GB. Dunno why. The batch file the I add is 1.2KB…..
How did you add your script into the boot.wim? Something is going wrong with the extraction of the boot.wim file, or its recreation, or both. I should note that the larger file sizes I wrote earlier are already at the extraction. Meaning that the 64bit boot.wim file is 820MB, but after extracting it, its (extracted) contents total to 2.11GB, and that is later also the recreated boot.wim’s file size. I ‘upgraded’ to a little better idea, which I think you should do in future builds. Instead of placing the batch file in the Startup directory, I put the batch file just anywhere on my thumb drive, and placed a shortcut to it in the Startup directory. So I have a shortcut to Y:\Commands.bat. This way I can edit the file and add commands whenever I want much easier. I suggest that future builds should have a shortcut to a batch that doesn’t exist. In the release notes make a line about the option of creating the file and adding commands. Or just an empty batch file. Anyway, thanks a alot for your help! Hi Gandalf…before I commit to the hefty download, does your PE environment include any functionality for uninstalling programs on the target (underlying) OS? Kind of like a Revo Uninstaller for WinPE? If not, do tools like that even exist? Thanks, and while it’s been awhile, I’m sorry about your wife. Lost my mother to cancer. Thanks and my condolences for you as well. Some of the suites may have an uninstaller but to be honest I really am not sure. If you want to hold off for a few days, I am releasing an update and it will include Revo. Happy to hear of another release. Thanks for your great work! I understand that you lost your wife recently. My condolences. Hi Gandalf. I downloaded the 10-7-2017 ISO and booted with it. 1) ImageX / GimageX is nowhere to be found. 2) The language never defaults to US English, and won’t go back to it despite my best efforts. The keyboard codepage, consequently, is always wrong and renders the build nigh un-usable. Easy Dism, Dism gui and wintoolkit all have the basic functionality as gimagex. If you want to hardcode english, edit the pecmdExt.ini in the root folder and rem out the other languages. Hi Gandalf. Thanks for such a quick reply! Unfortunately, I need the real deal: ImageX itself. That in and of itself is not a big deal, as I can always copy those over to the image later. It’s that language setting. I have tried to CTRL+TAB my way over to U.S. English. It doesn’t work. Every CMD window I open, every dialog I open in the GUI still presents the wrong keyboard codepage, even with U.S. English selected. Thank you for your work. Great job! © 2019 Musings of an IT Pro. All rights reserved.